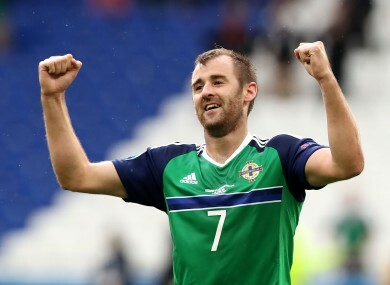 FORMER DERRY CITY and Celtic winger Niall McGinn has signed for South Korean club Gwangju, becoming the first Northern Irish international to play in the country’s top tier. Breaking the news of his switch to the K-League on Twitter, McGinn said he had met with former Celtic team-mate Ki Sung-yueng’s father, who is Gwangju president, before making his decision. “I am absolutely delighted to have signed for Gwangju FC”, he wrote. “Since I met the club president a few weeks ago in Belfast I have been researching Asian football and Korean football in particular. I have been very impressed with what I have discovered. The 29-year-old departed the Brandywell in 2009, joining Gordon Strachan’s Celtic where he made 28 appearances in three seasons at Parkhead. The Dungannon native went on loan to Brentford for one season where he made 37 appearances before signing for Aberdeen where his contract has expired following five seasons playing for the Dons, scoring 58 goals. Stephen Kenny signed McGinn for Derry City in January 2008, meaning the player had to forego his commitments to Donaghmore and the Tyrone U21 setup. Attracting attention throughout a campaign in which he made 31 appearances as the Candystripes finished third, McGinn signed for Celtic, earning the man of the match award on his competitive debut against Dundee in September 2009. McGinn played 30 times as Aberdeen finished runners up to Celtic in 2017. The club also lost the Scottish Cup final where McGinn earned the assist for Jonny Hayes’s opening goal which gave them a 1-0 lead before going on to lose 2-1 to Brendan Rodgers’ side who completed a domestic treble. The 29-year-old has also represented Northern Ireland on 50 occasions. The player scored a decisive late goal against Ukraine at Euro 2016 which sealed a historic 2-0 win for Michael O’Neill’s side. “When I joined Aberdeen in 2012 I had no idea of the great times that lay ahead”, the player said paying tribute to his former club. “The fans at Aberdeen also deserve immense credit and thanks. They took me to their hearts and I took them to mine. “I am looking forward to continuing my career at Gwangju FC. I am the first Irish player ever to have signed for a Korean club. Gwangju are currently bottom of the K-League after 17 games having joined the South Korean top flight six years ago in 2011. Email “Ex-Derry and Celtic winger becomes first Irish footballer to play in South Korea”. Feedback on “Ex-Derry and Celtic winger becomes first Irish footballer to play in South Korea”.